Now that B is running around and constantly pondering his next activity I have realized finding useful/attention grabbing toys for his age can be difficult. One to two year olds are in the exploring phase, but still have a short attention span when it comes to playing with one toy and they have yet to begin imaginative play. Obviously, every toy we own does not undergo intense scrutiny, so we have a few that do not fit all three criteria, but for the most part considering them does prevent me from buying everything I "think" he'll like. Here are 10 toys that we currently have/or are considering. 1. Melissa and Doug Alphabet Nesting and Stacking Blocks - These blocks are card board boxes that are open on one side. They were given to B for his birthday and have proved to be an excellent toy for his age. He has learned to stack using these boxes. He has also learned to identify various animals, as each block has 3 letters of the alphabet, an animal, and various other objects beginning with the same letter represented on the box. He enjoys putting other objects inside the various size boxes and also enjoys knocking the tower of boxes over. As the months pass, I suspect he will begin identifying letters on the boxes as we continue to sing the ABC song while pointing to various letters on the boxes. Plus, they are very inexpensive. 2. Bee Bop Band Drum and Instruments - B has been playing with his drum set since he could sit up. It began with chewing on various instruments while listening to the noises, progressed to an object that helped support him while standing, and now is a source of exploring and learning to play the various instruments. He enjoys taking each instrument out of the drum, placing the lid back on the drum, and attempting to play them. He can easily shake the shakers and is beginning to figure out the drum, but he still has many months/years before he is stomping through the house (like my nephews used to do) pretending to be in the marching band. Flap books are great for fine motor skills, memory, and most of them are educational. 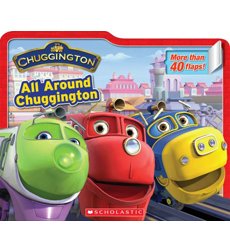 The Chuggington book has a page that focuses on colors, animals, and numbers. The Fisher Price books focus on shapes, animal sounds, numbers, colors, etc. 4. Safari LTD animal collection - This is one of my personal favorites as there are an endless number of animals that can be collected and they can be used for years to come. Safari Ltd. is the brand that makes the animal replicas that can be collected or in B's case played with. You can buy them individually or the smaller versions can be purchased in tubes (ie. farm collection tube or rainforest collection tube). We have purchased various animals from Michael's and Target. It has been the animal replicas that we have used to help B learn animal sounds. He also loves to put the animals in and out of containers or take them on a car ride. 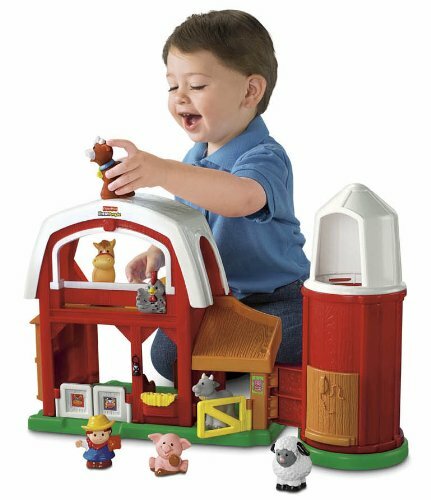 As he gets older the animals will be perfect for pretend play indoors or outdoors. Other advantages, they are small taking up little space. They are easy to take to a restaurant for your child's entertainment. If your parents/in-laws go on a unique vacation and want to bring your child a gift these are excellent. 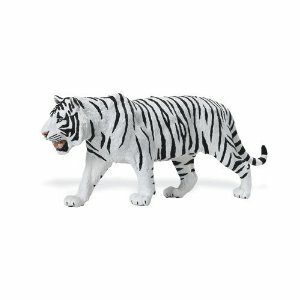 Depending upon your location, Michael's stores carry the animal line most common for that area. For example, my in-laws went to Alaska and were able to find several Safari Ltd. animals unique to Alaska to bring back to the boys. Those same animals can not be found here in Florida. 5. 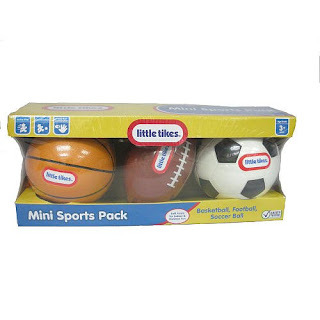 Mini Sports Ball Set - We don't have this set, but I have been wanting one for B for a few months. We have other balls that serve the same purpose, but I like this set for a gift for a young boy (maybe a 1 year birthday gift). I don't think I need to explain the benefit of having various shaped and various sized balls around your house for a boy or a girl. 6. 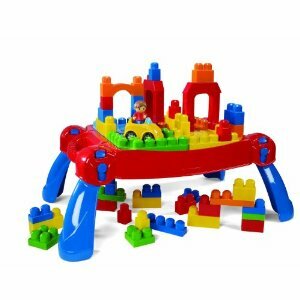 Mega Bloks Play 'n Go Table - or just the bag of Mega Bloks or Duplo Blocks.....something that further encourages building, stacking, and the use of fine motor skills. We don't have any at home, but B plays with them at my in-laws. He is currently in a phase where he is not all that interested in these blocks, but a few months ago he loved them and I know he will return to enjoying them as he learns he can build a fort, a stadium, a parking garage, etc. 7. Little People Farm (or Noah's Ark, Happy Sounds Home , etc.) -B has the farm and has been enjoying it since the day we brought it home. Like all other toys, his favorite thing is to take the animals out and put them back in, but I know as he begins imaginative play the barn and the animals will take on a new meaning. In the future, the barn may become a house or a fort for protection or maybe it will just remain a farm. The animals may become spectators, soldiers, or a part of a parade. **BTW, I prefer no sound affects. Fortunately, you can turn the sound off on the bottom of our farm. 8. 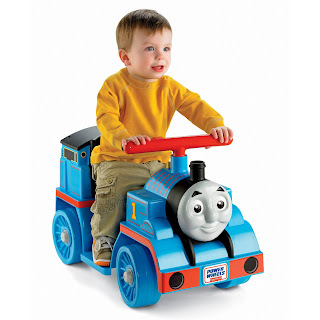 Toddler Sit or Push Vehicles-You can find these in almost any theme you desire. Here is Buzz Lightyear, the Little Tikes version, or the Fisher Price version. These are great for those learning to toddle (as long as the one you purchase has a handle in the back). Now that B toddles everywhere he loves trying to climb on and off his Thomas the Train vehicle. He is learning to propel it with his feet now, while sitting on it, which is great for his gross motor skills. 9. Medical Kit -Not all kids will enjoy or play with a medical kit, but most children do go through a phase where they become very interested in the body. It is during this phase that I think parents have a great opportunity to teach their children much about various parts of the body, general health, and to continue explaining/preparing for the routine doctor appointments. 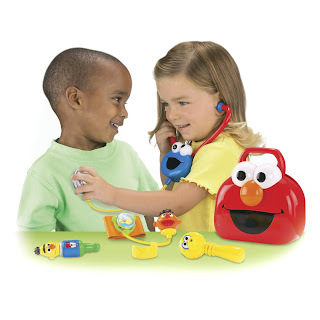 I realize this usually occurs later than 18 months, but B was given the Sesame Street Medical Kit (seen below) and he loves to play with the band-aid and the stethoscope. The band-aid can fit around their wrist and Cookie Monster talks when you play with the stethoscope. It is quite a hit at our house. B is also more comfortable at the doctor when she checks his breathing, his heart beat, and his ears now that he is more familiar with the tools used. 10. Cardboard boxes, Large Plastic Containers, oh and those Plastic Magnetic Letters will lead to several hours of entertainment, as well.- No explanation needed. Kids have been using them forever. Is there any specific toy you would recommend for 12-18 month old children? I am linking up to Link and Learn. Cardboard box...specifically refrigerator box. :) Seriously, it's the only toy I remember...well that and the cardboard bricks my parents gave us. Wish I was a toddler again to get that cool stuff! Jack loved the set of balls (football, soccer, and basketball) and would not let them out of his sight for months. They are all great toys, reminds me to buy more age-appropiate toys for Jack! I am so thankful that you are sharing toys that work for Bennett. Just today I found the Melissa and Doug nesting boxes. While I know that Wyatt is still too young for them, soon he will be able to use them. And, I found them at TJ Maxx for just $7.99. 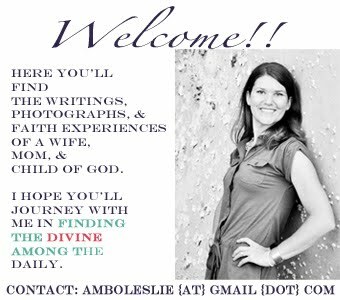 Thanks again Amber! !